Reason precisely and defend their conclusions. Use mathematics to model a scenario concerning volume. Before the lesson, students attempt the Packing It In task individually. You review their responses and formulate questions that will help them improve their work. At the start of the lesson, students read your comments and consider ways to improve their work. In pairs or threes, students work together to develop a better solution, producing a poster to show their conclusions and their reasoning. Then, in the same small groups, students look at some sample student work showing different approaches to the problem. They evaluate the strategies used and seek to improve the arguments given. In a whole-class discussion, students compare different solution methods. Finally, students reflect individually on their learning. 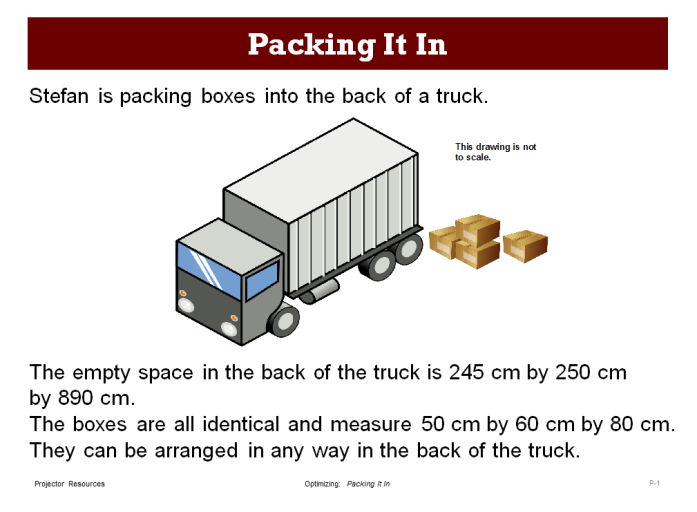 Each student will need a copy of Packing it In and How Did You Work? and some blank paper to work on. Provide calculators for students who wish to use them. Each pair of students will need the three Sample Responses to Discuss, a piece of poster paper, a marker and some glue. Have graph paper and if possible, unifix cubes or small cardboard boxes available. 6.G: Solve real-world and mathematical problems involving area, surface area, and volume.